Buyer's Remorse: Is It Ever A Good Time To Buy A Gadget? If you’re reading this site you obviously have a love of technology, gadgets or gaming, or possibly a combination of any or all of them. You have also probably experienced “buyer’s remorse” at some point or another. You know how it goes, you buy a gadget, and then just a few months later something else comes out with features that improve on what you just bought. You go about kicking yourself and attempt to come up with some plan to either dump the one you have for the new one, or you find some way to rationalize with yourself that it really isn’t crazy to own both. And this brings us to the question of just when should you plunk down your hard earned money to buy a new technology or an upgrade? That is exactly the situation a recent survey by ChangeWave discovered when it polled 3,171 consumers. Of those that had bought Kindles, 45% were happy with the device, but 27% wish they had waited for the iPad. This is but one example of the type of situation we are talking about, and it seems to impact all of us at some point. Believe me, I have been a victim of it more than a few times in my life, and it’s how I’ve ended up with some of my gadgets from people selling me at a heavy loss the ones they regretted buying too soon. As I’ve gotten older I have gotten to more of an “Oh well” attitude because if you always waited for the latest and greatest you would never end up buying any piece of technology (and your wallet would be a lot fatter), but there has to be some sort of sweet spot. Taking the iPad as an example again since it’s the hot device right now, as much as I would like to have one, there is no way I’m buying a first generation unit. Apple’s track record shows that at least a couple of features are always held back for the second version of its devices, such as 3G being withheld from the first iPhone and an external speaker not showing up until the second iPod Touch. While Apple has some predictability to it, the same can’t be said for other companies, but if you just apply simple logic you can usually predict what will happen. The first Kindle only had four shades of gray, and honestly the physical form factor was so awkward looking, you just knew there had to be some refinements. 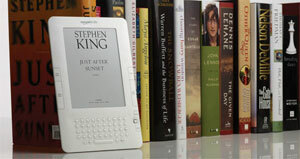 Add in that the overall e-reader market is still so young that you can pretty well predict that within the next two to three years they will be completely different beasts than what we have now, and something you will be better able to live with through a couple generation changes. Essentially you just have to go with your gut and realize that there will always be something bigger and better coming down the pike. You can’t stop it, and you just have to ride it out as best you can. Take a look at history before you plunk down your money, take a look at others saying and then just make the best decision you can. What are your tips for the optimal time to buy a new gadget?